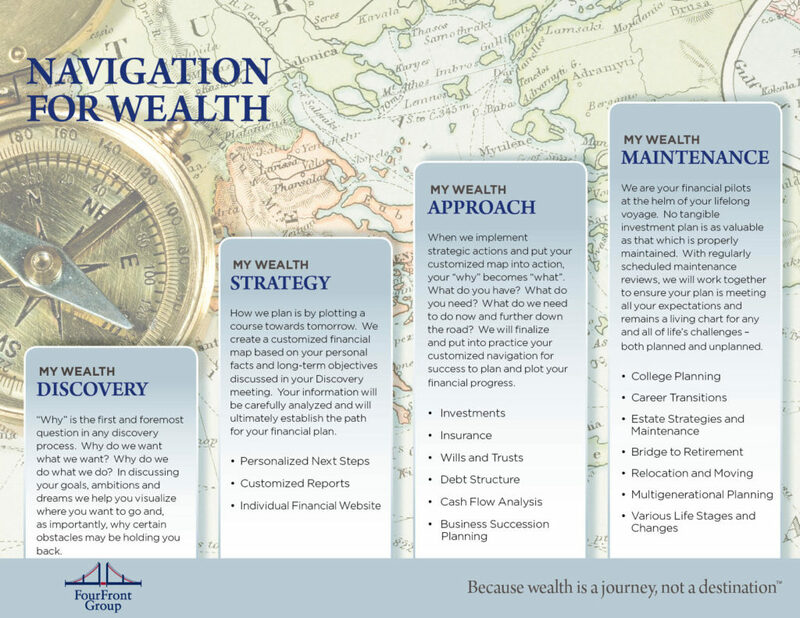 Navigation for Wealth™ is our custom process that allows you to identify and organize your goals and priorities so you can stay confident that you will reach you maximum potential while staying in control of your assets and wealth. As a Navigation for Wealth™ client we ask you “WHY” as the first and foremost question in our discovery process. Why do you want what you want; and why do you do what you do? In discussing your goals, ambitions, and dreams we help you visualize where you want to go and assess what might be holding you back. Together we build a financial plan that is specific to your individual needs and circumstances now and down the road. In short, we help you navigate life’s complicated waters. We’ll help you get to where you want to go. Navigation for Wealth™ has been built to help provide security, confidence and prosperity for all by providing a structured methodology for every individual, family and closely held business.